Perhaps it’s related to being perennially both inquisitive & distractible, but I’ve always enjoyed taking notes and almost always have paper with me. Here’s a few of my old pocket notebooks—my family knows they’re a reliable fallback gift! So why am I excited to be celebrating the start of this semester by not buying any new notebooks? Like with Gennie’s post on learning from past mistakes, I’ve thought long and hard about how I take notes. I don’t mean class notes here, since there have been some compelling studies that suggest taking class notes by hand is more effective than using a computer. I’m talking about all the incidental stuff that comes up in library school: notes on reading suggestions, on things that you learn and do during student jobs or internships, on new technology you want to check out, thoughts for research or conference submissions, etc. How do you make sure that you keep track of all this so that you can get to it when you need it? 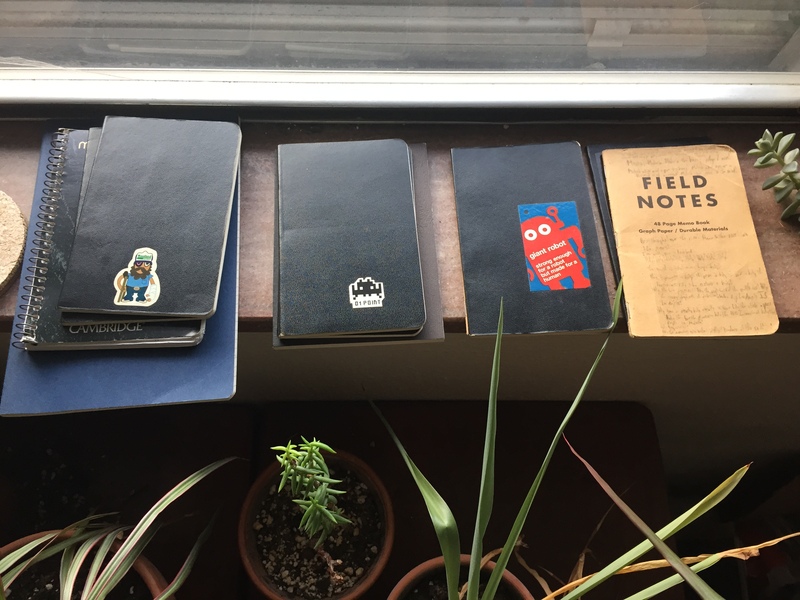 A few of my pocket notebooks and plants. I’m going to share with you the basics of what I do. But more fundamentally, this post is an invitation for you to pause before the year & term really get underway and to consider how you take notes. Tech and notetaking preferences vary wildy, so please share what works for you if you’re so inclined! For instance, I enjoyed reading Becky’s post on taking handwritten notes on her tablet, even though my scribbles “penmanship” will never receive warm reviews. It’s always good to learn from the approaches other people take. The two main things I’m a fan of are using plain text files with Markdown syntax whenever possible and keeping track of tasks by using something like the Bullet Journal syntax. As librarians, archivists, or other LIS professionals, a lot of us will write things that end up on the Web. Markdown is a syntax that supplies shortcuts for html code. For instance, instead of writing <a href="http://daringfireball.net/projects/markdown/">click here for the Markdown project homepage</a>, you can write [click here for the Markdown project homepage](http://daringfireball.net/projects/markdown/). Although they might not immediately seem that different, these feel profoundly different to me while I’m in the writing process. I can just write [the words for a link]() and get on with letting my ideas flow, then go back and look for the best page to link to later on. Markdown also lets you do simple styling of text, such as surrounding words with asterixs for emphasis and strong emphasis (formerly thought of as italics and bold until HTML5 got more strict about differentiating between codes and their presentation). Markdown also lets you write heading levels (by using octothorpes—# or “pound signs”) and some applications like Editorial (iOS) and FoldingText (Mac) will use that structure in their own interfaces. Markdown also does simple ordered or unordered lists, which I find really useful for keeping track of tasks. Here’s an example of Markdown encountered in the wild. On top of the web-writing features in Markdown, the files are basically just text files, the smallest, most portable, and most future-proof file format there is. The contents can easily be searched by your computer’s finder or index. David Sparks, a lawyer and technology writer, has a great post that helps show why plain text is an excellent format for your typed thoughts. Although I use different programs and sync them all through Dropbox, his post is pretty compelling. 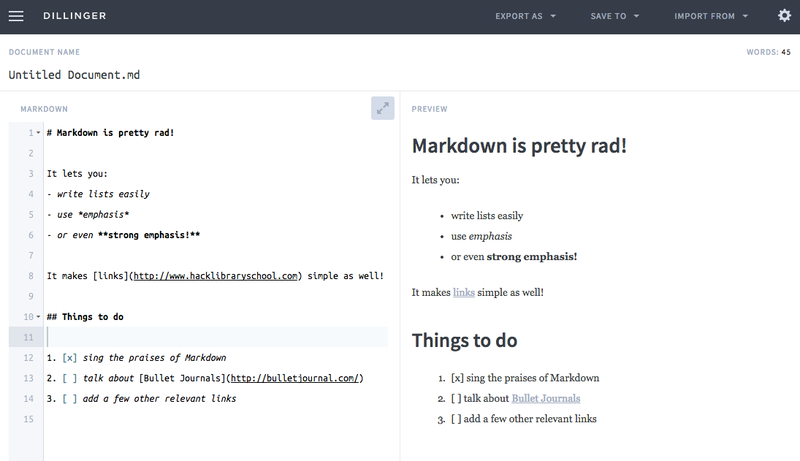 If you want to read more about the Markdown syntax, GitHub has a great page on it here: Mastering Markdown. The web app Dillinger.io lets you write in Markdown and then convert whatever you’ve done to a Google Doc, to html, to a PDF, etc. It’s also got a cheat sheet on the syntax, so it’s an excellent place to start toying around with Markdown to see how much you like using it. Bullet Journals are basically just a syntax for keeping track of tasks and notes on paper. Ryder Carroll, the art director and interaction designer who named them, has made an excellent website about it. Seriously, that website seems like a great model to remember if you write process examples for a library page someday! The essence of bullet journaling is to just keep track of tasks, notes, and ideas with a syntax that helps you differentiate them all at a glance. When I’m working a student job and don’t want to appear rude by using my phone, I’ll write notes in bullet journal format on scrap paper and then type them up later if they’re still relevant. I’ve got an app on my phone that syncs with all the notes I have in a folder on Dropbox, so I’ve started making files for each month and for each project I’m working on. While I primarily use these electronically, I use some of the bullet journal syntax in them to let me know if I’ve finished things at a glance. One great thing about this is that when I need to know what I’ve accomplished, it’s all there. Also, when I know there’s an article I want to re-read, I can just search that folder for something like “antelope document” and my note mentioning it will pop right up! The people who write the ProfHacker blog at the Chronicle of Higher Education have a number of posts about Markdown, including which different text editors and webtools they prefer. nvALT for Mac I leave this program open all the time on my computer. It’s basically essential for me. ResophNotes for Windows I don’t have a PC, but I’ve heard great things about this. nvpy for Linux I haven’t yet converted my old laptop into a Linux machine, but I’ve read good things about this. How do you take notes? Do you have any other suggestions? I. Need. to Learn. Markdown. Thanks for today’s daily reminder! I read some other people’s excitement about bullet journals, and I got excited too. I love that kind of list system. But… give me Evernote’s search function over anything clever. The chances of me bullet journaling in an effective way are pretty slim! If you use Evernote, Becky, you might be interested in Markable: http://markable.in It’ll let you edit notes in Markdown and then save the text or html output to Evernote, Dropbox, or Tumblr. Most Markdown editors have built-in “cheat sheets” for the syntax, so for me the trickiest thing about learning Markdown was just getting used to converting it to html or pdfs. If you have any questions about it, let me know! There’s no way I could do a “proper,” exclusively paper bullet journal either. Not only do I rely on search functions, but I type way faster than the speed of scribble! Being able to quickly see if I’ve done everything on my scrap paper notes before leaving a student job shift has saved me more than once after I jumped from focusing on a project to helping a patron, though, so it’s a nifty way to stay effective with shorter-term tasks when you know you’ll be interrupted. Someday I’ll document my highly sophisticated Legions Of Tiny Notebooks patented note-taking system, but until then — thanks for some great ideas, Ryan. The search function is key for me too. I find myself filling notebooks with Post-It tabs and saying things like, “It was on a right-hand page in blue ink…” just constantly. Time for a change? Interesting topic, Ryan. My note-taking system is a total mess: I have notes on my phone, laptop, Google drive, and in my journal. I tend to write things down wherever is most convenient at the time. These are some great tips to get organized!